KOLKATA: Gorkha Janmukti Morcha (GJM) chief Bimal Gurung called for an NIA probe into Gorkha Territorial Administration (GTA) chairman Binay Tamang alleging that the violence perpetrated during the 104-day long Gorkhaland agitation was the result of a nexus between Tamang and the Mamata Banerjee-led West Bengal government. Gurung, who has been in hiding and wanted for murder, rioting, arson and cases under Unlawful Activities Prevention Act alleged that the nexus existed between Tamang and the West Bengal government since the commencement of the agitation in mid-June. Gurung claimed that Binay Tamang had taken crucial decisions without consulting him or the GJM central committee. In a press release issued on Tuesday, the GJM supremo said, "The very call for indefinite strike announced on the June 16 was made by Binay Tamang without any consultation with GJM central committee. It was Tamang who had repeatedly called and instigated for 'intensifying agitation' after August 8. "On August 18, only 10 days after the call given by Tamang for an indefinite strike, the first bomb went off in Darjeeling town. This, I am now convinced was not a coincidence because while the Bengal police immediately rushed in to file charges under UAPA against me other GJM leaders; there was no such move against Binay Tamang who had actually called for 'intensifying the agitation'," said Gurung in the press release. "While cases were slapped against us, Tamang nominated himself as the chief coordinator of GJM on August 23 without consulting me or the central committee," he added. The GJM supremo also cried foul on the difference in treatment meted out by West Bengal administration to Tamang and other GJM leaders. Gurung said, "On August 29, he (Tamang) attended the talks in Nabanna and was immediately provided with heavy security. This, despite the fact that he has more cases filed against him than the Morcha workers who are being made to rot in jail even today. "It is telling that Barun Bhujel, who was an elected municipality councillor from Kalimpong and had only one case against him died in police custody while Binay Tamang and Amit Thapa, with so many cases against them, are walking under full police protection," he added. The GJM supremo also expressed hope that he would be proven innocent after the NIA probe. " I am confident that while the investigations will exonerate us who are currently being hounded by Bengal government, it will help in identifying and punish the true perpetrators of these crimes against our nation and the Gorkha community," said Gurung. 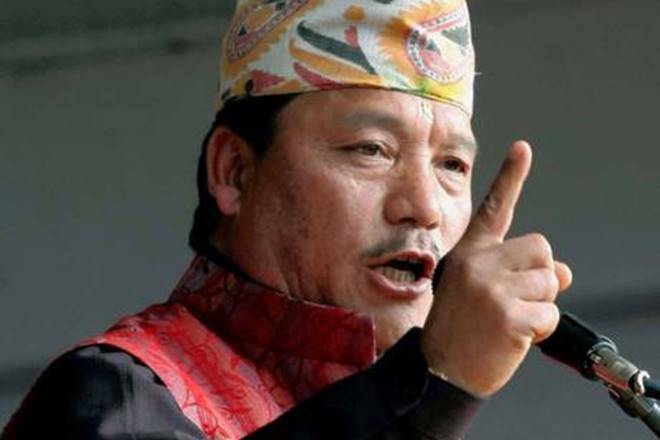 Gorkha Janmukti Morcha (GJM) chief Bimal Gurung called for an NIA probe into Gorkha Territorial Administration (GTA) chairman Binay Tamang alleging that the violence perpetrated during the 104-day long Gorkhaland agitation was the result of a nexus between Tamang and the Mamata Banerjee-led West Bengal government.